HP Operations Manager for Windows and UNIX have revolutionized the way that businesses manage and synchronize their heterogeneous IT operations. However, the product lacks a flexible, web-based reporting interface. 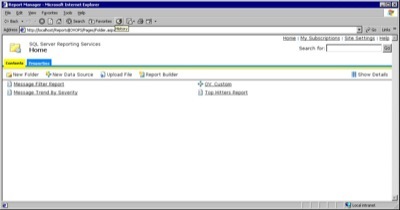 Instead users must depend on the Operations Manager administrator to generate reports, which are limited and often lacking because they only display alert information in the history browser. Furthermore, this information is archived after a few days and then certain attributes are subsequently discarded. 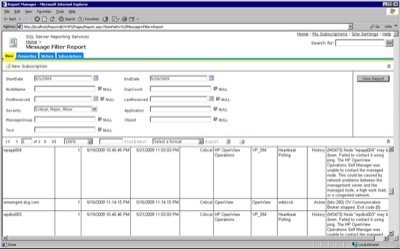 Fortunately, Operations Management Informer is a self-service, web-based reporting interface that allows clients to retrieve historical alert information, based upon multiple attributes within a HP Operations Manager alert, as far back as is needed (or as storage or retention policies allow). This functionality is referred to as the .Message History Query.. The overall reporting interface is customizable and also comes with canned reports for: Message Trend by Severity, Trouble-Ticket Information for Alerts, and High Duplicate Count. Another bonus is that the product does not require HP Operations Manager to be running in a data warehouse mode and is especially convenient in a heavily-regulated environment where retrieval of alerts is essential in incident and problem management activities. Created by the Dynamic Consulting Group and released in June 2007, the Operations Management Informer user-interface is simple and intuitive, ensuring a short learning curve for users and rapid integration with your HP Operations Manager environment. Operations Management Informer is a read-only web interface that allows users to partake in "self-service" report generation. Message Trend by Severity, Message Search Report, and High Duplicate Count.